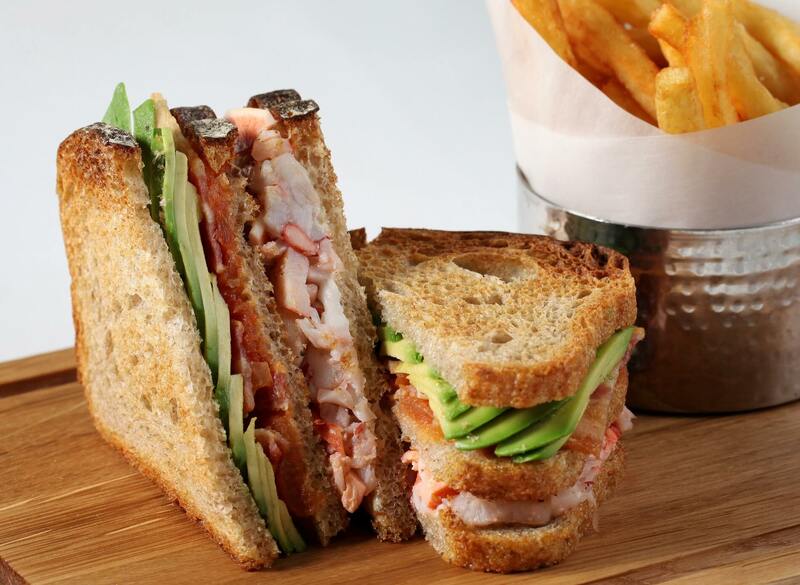 The Story: Opened in 2012, Monty’s Deli is all about perfecting the classic sandwich. They bake their own bagels, cure their meat, make their own special mustard and even bake their own rye-bread. Their portions are large and much like KFC’s crispy chicken skin (how do they do it?!) their recipes are closely guarded secrets. At Monty’s Deli you get good, Jewish food made with love. The Sandwich Lowdown: Their sandwiches are absolutely massive. We’re talking about Reuben sandwiches that can keep you full for hours and best off all, they don’t scrimp on quality – they make their own salt beef and pastrami. 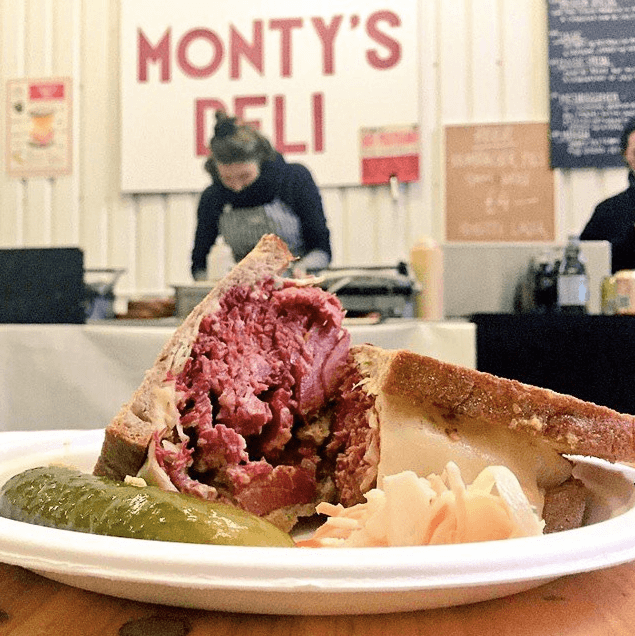 Monty’s Deli is a must for any sandwich fan. Take that Subway. The Story: Max Halley the founder of Max’s Sandwich Shop has cooked in London’s high-end restaurants including Salt Yard group and Arbutus. He’s ditched the fine dining life for the simple one with his sandwich shop serving some outrageously good sandwiches. No fuss, no frills, just simple, honest food. This is a place where sandwiches are served on greaseproof paper and hands are preferred instead of cutlery. The Sandwich Lowdown: An overly complicated menu it isn’t with four sandwiches on offer. Pick between ham, eggs and chips (yes, in a sandwich) or the what’s your beef all about – braised beef with parsley and pomegranate slaw. Go wild and order their pork scratching and deep-fried jalapeño mac ‘n cheese balls for the purse friendly price of a quid. The Story: The Savoy is the iconic art deco hotel found on the Thames and provided great tv viewing with their fly on the wall documentary aptly named ‘The Savoy’. The Savoy is home to Kaspar’s Seafood Bar and Grill, a 1920’s themed restaurant specialising in fresh and smoked fish, oysters, caviar and scallops from North West Scotland. 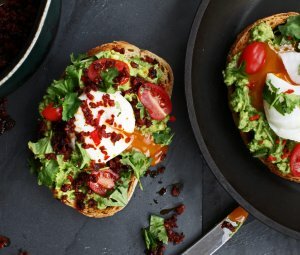 The Sandwich Lowdown: This certainly isn’t a meal deal sandwich and with a £25 price tag, it’s certainly costs more than a meal deal (or three). This is a club sandwich with a difference, using the freshest Scottish lobster layered on sourdough toast with tomato jam and served with a generous helping of chips – taking gourmet sandwiches to the next level. 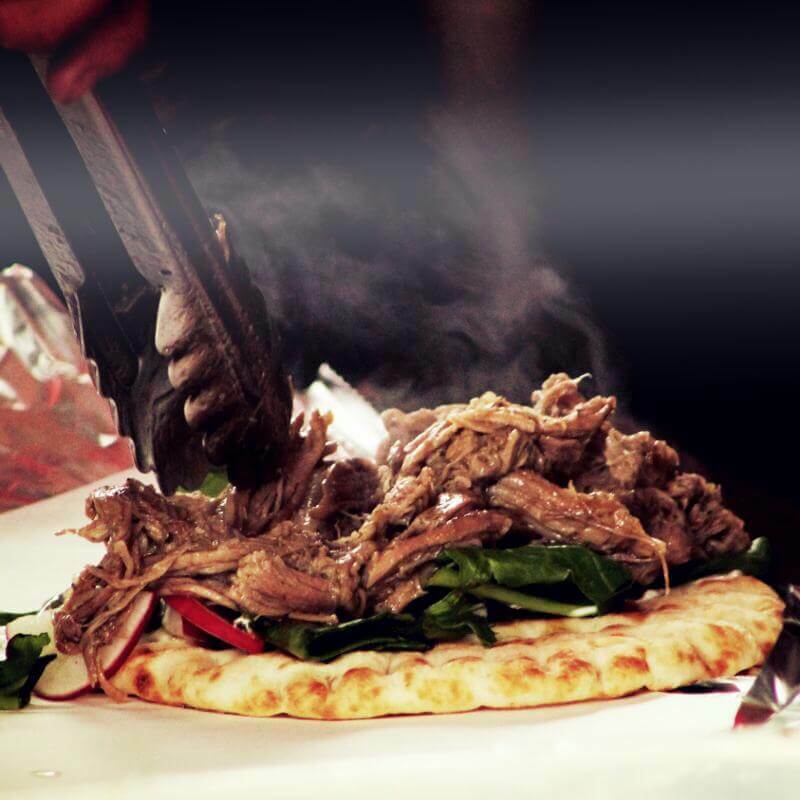 The Story: First launched in April 2015, Hungry Donkey is a casual restaurant dishing up top quality Greek food. Inspired by classic Greek street grub, their focus is on creating quick, wholesome food feeding the hungry East London crowd. The guys at Hungry Donkey have nailed the fast,healthy food life using simple and responsibly-sourced ingredients. 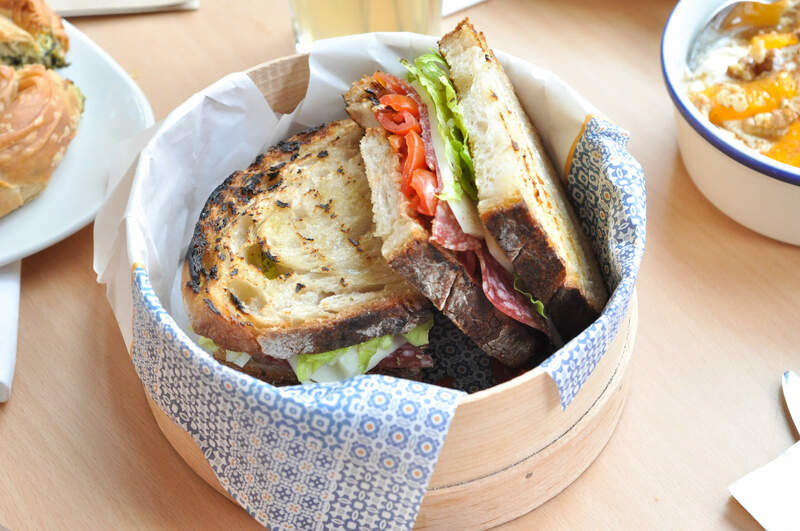 The Sandwich Lowdown: Their sourdough sandwiches are a new addition to the menu with 3 to choose from. They’ve decided to keep it unpretentious with their sandwiches, with the big focus on flavour. Order the flava puree, tomato and chicken sandwich or pastrami, tomato, onion with lemon vinaigrette. Both are cracking options. 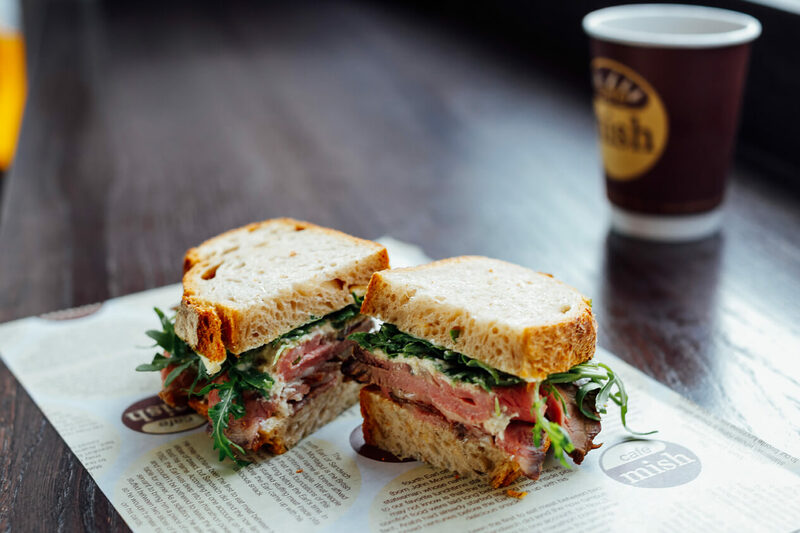 The Story: Cafe Mish is a recently opened gourmet sandwich shop in Mayfair and is well worthy of the hype. At the heart of Cafe Mish is the ingredients, using the finest, locally- sourced seasonal British produce. 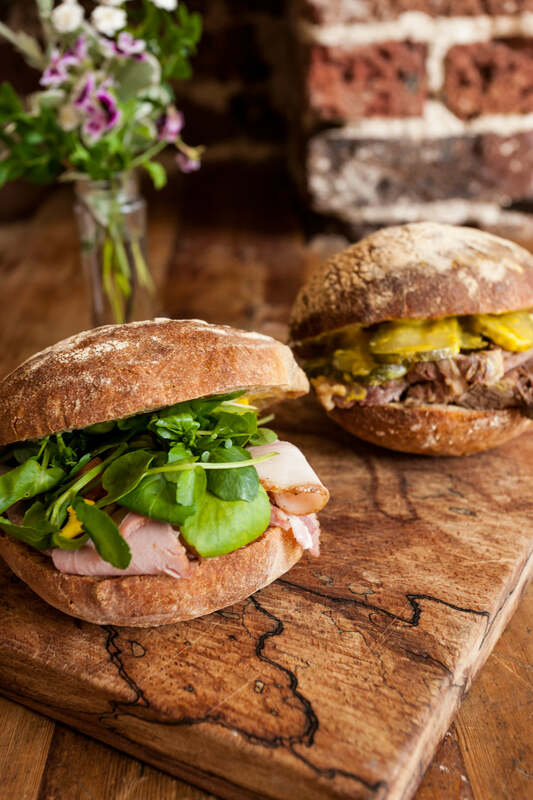 The Sandwich Lowdown: The sandwiches do all the talking at Cafe Mish with the the salt beef gourmet sandwich the real star of the show – slow braised salted beef from Hensons, sweet pickle gherkins, dijonnaise on Caraway bread. The bread is good quality, none of this wafer thing stuff and they source their salmon from H Forman & Son, that’s quality fish right there. The Story: Where do we start with Delancey and Co, stepping into their sandwich bar is like stepping into a New York deli. They have a huge menu full of sandwiches, salads, chicken noodle soup and sugary treats that will make you feel like a tourist in M&M’s World. Hello, cinnamon and raisin bagel with peanut butter and marshmallow fluff. Enough E numbers to last you a lifetime – still tastes damn good. The Sandwich Lowdown: At Delancey and Co, it’s all about build your own and we’ve got a lot of time for that. Pick your bread and filling with the option of making it carbless if you wish. Their salt beef is outrageous, with it being cooked on the premises fresh, every day – tender and full of flavour. Load up with extras from their salad bar and wack on a sauce of your choice. Their sandwiches will make you weep with joy and will no doubt make an appearance on your Instagram. The Story: Mark aka The Rib Man has been a butcher since he was 15 and he knows his meat. 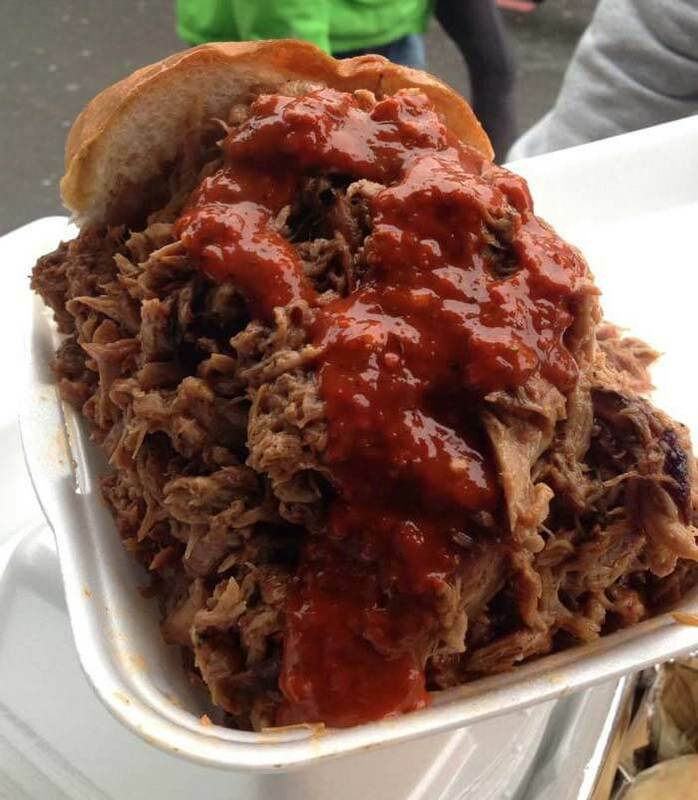 The Rib Man isn’t just your run of the mill street food stall, it’s an institution. Up and cooking prime baby back ribs on Brick Lane at 3am ready to serve at 9am, Mark is dedicated to bringing the best ribs to London – bold claim, but it’s true. The ribs served are so well-loved, Man v Food presenter Adam Richman can’t get enough of them. 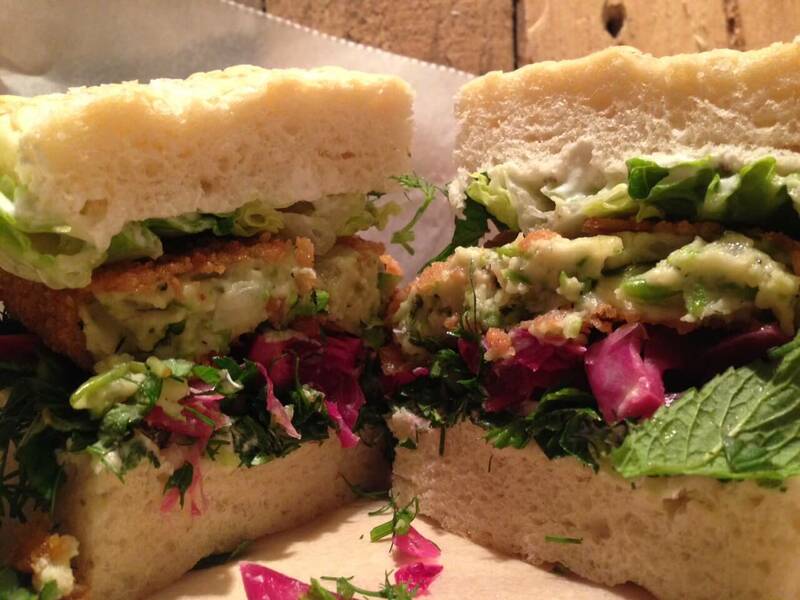 The Sandwich Lowdown: This will be the best £7 you will ever spend at a street food stall. The ribs are marinated with Mark’s homemade rubs and are slowly cooked over a couple of hours, shredded and then stuck into a bap. For an added kick cover it in his homemade Holy F*** sauce. Crikey. Get down early, once he’s sold out you have to wait another week to get your hands on his delicious meat filled sarnies. 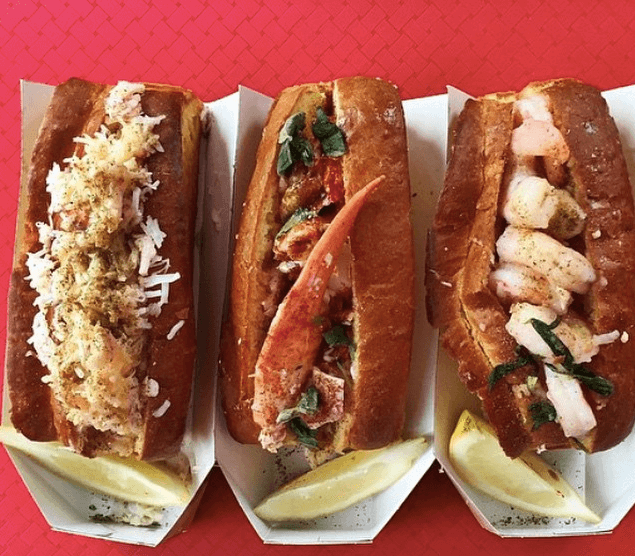 The Story: Serving up lobster and crab rolls from their 1957 VW Camper Van, B.O.B’s lobster has become a firm favourite at food markets across the city. Dining at B.O.B’s lobster is anything but basic, head to their van for some bourgeois dining all washed down with a glass of Prosecco. They also sell a lobster mac ‘n cheese containing not one, but four glorious cheeses – oh baby. The Sandwich Lowdown: Every good sandwich starts with a good sturdy bread and at B.O.B’s Lobsters they’ve gone with the buttery, brioche bun option filled to the brim with crab meat. Their lobster roll is what they’re also known for – fresh lobster tail, claw and mayonnaise. The Story: Mark Jankel formally of the The Food Initiative and Jun Tanaka formerly of Pearl are the masterminds behind Street Kitchen. 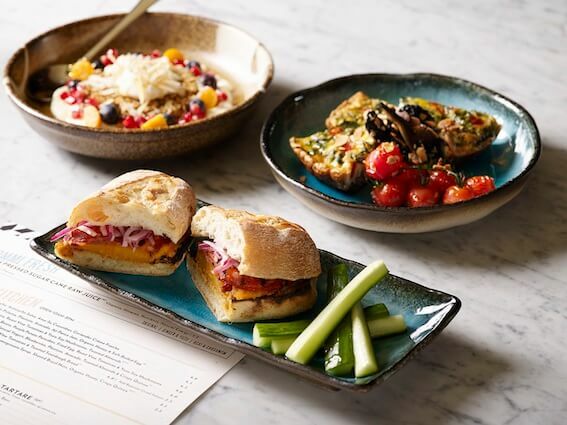 You can forget your over complicated burgers, ‘superfood’ salads and pizzas topped with half the veg aisle – Street Kitchen is about ‘slow food, fast’ – an entirely new proposition on London’s grab-and-go dining scene. 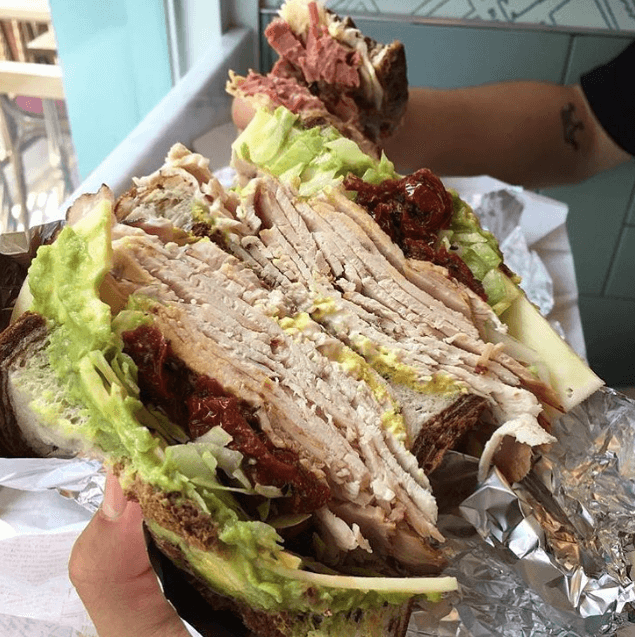 The Sandwich Lowdown: The shop has now considerably upped the sandwich game by specialising in signature 24-inch sandwiches served ‘by-the-inch’. 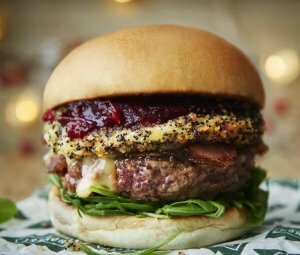 Fillings include charred organic broccoli with free-range eggs, smoky mustard mayo, pickled red onions and Old Winchester cheese and rare roast beef with caramelised onions, watercress, pickled cucumber and horseradish. The Story: It’s truffles a plenty at Tartufi & Friends with the restaurant creating innovative dishes with this beloved Italian delicacy. Think burrata drizzled with truffle honey and fresh truffle and the mighty Tartufi & Friends burger, served with foie gras, sweet onion marmalade, truffle mustard, mayonnaise and fresh truffle. If you’re not a fan of truffles, this probably isn’t the restaurant for you. 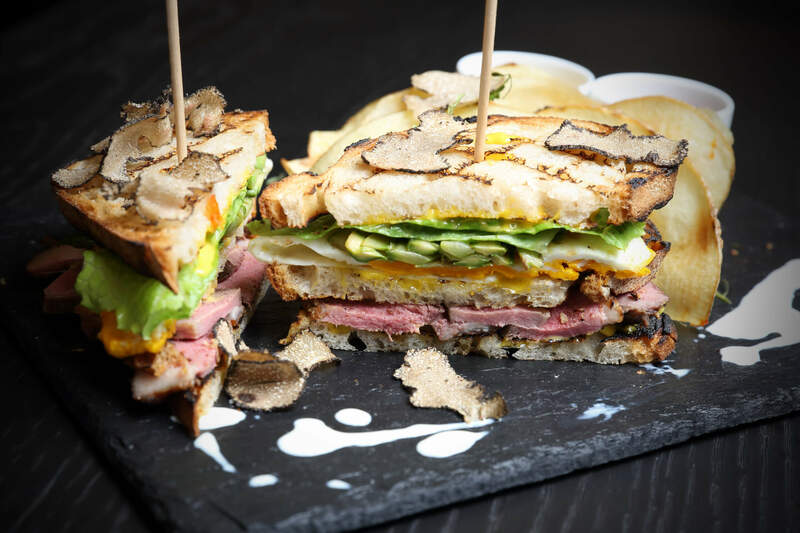 The Sandwich Lowdown: For the price of a dress in Topshop, you could be dining on the duck club sandwich at Tartufi & Friends. 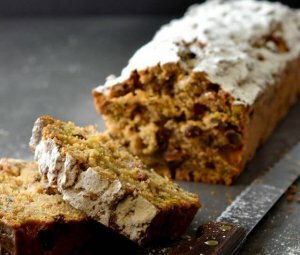 This isn’t just a quick grab and go sandwich, this bread-y delight needs to be savoured. Crispy asparagus and celeriac with Truffle, egg, corn crisp, pomegranate truffle fries and fresh truffle. All the truffles. The Story: Playing homage to the roaring 1920’s in New Orleans, Hank’s Po Boys are big on creole and cajun flavours creating some of the finest po boys this side of The Atlantic. 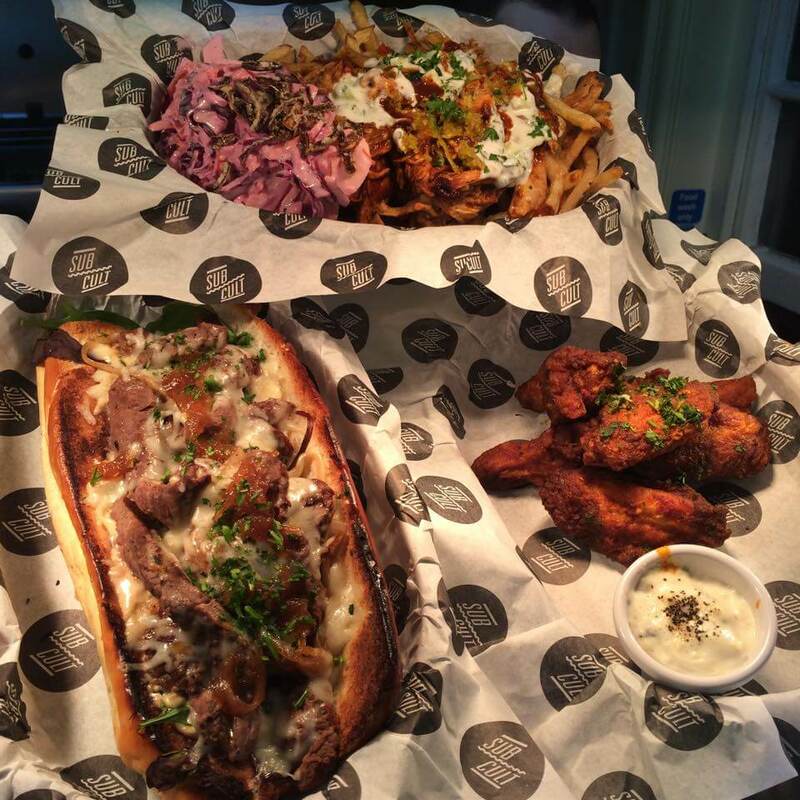 Their New Orleans inspired sandwiches are packed full of slow cooked meat – we can seriously vouch for their poor boy sandwich – Creole beef brisket and debris gravy, served with hot sweet slaw and horseradish mayonnaise. The Sandwich Lowdown – At Hank’s Po Boys their secret to the ultimate po boy is using the best possible ingredients around. Their proud boy is our favourite, a crispy French baguette piled high with sustainably sourced fish and dressed with their homemade mayonnaise. The Story: House of Ho is a modern Vietnamese restaurant with the menu full of traditional and adventurous dishes. Bobby Chinn, the man behind House of Ho lived and worked in both Hanoi and Saigon for 17 years. Chinn is a big fan of the quirky, contemporary approach to Vietnamese cookery and it shows in his dishes – inventive sharing plates, steaming bowls of pho and summer rolls. 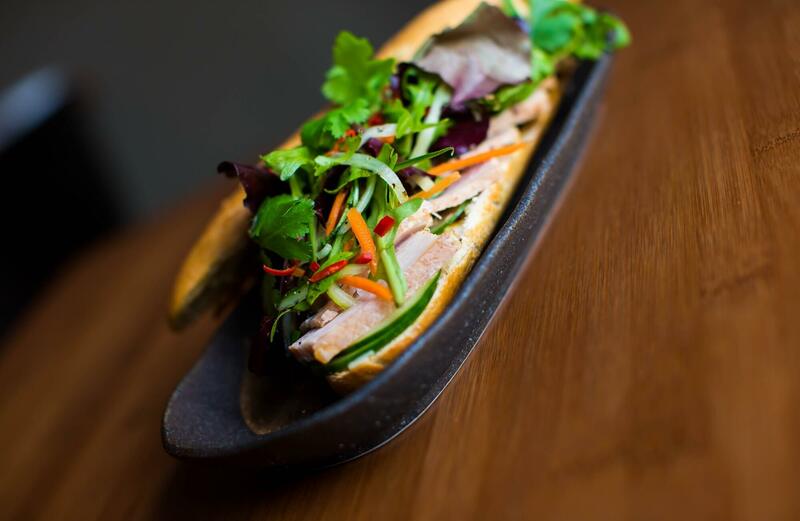 The Sandwich Lowdown: Bành Mi means bread in Vietnamese and the sandwich takes influence from the french occupation. 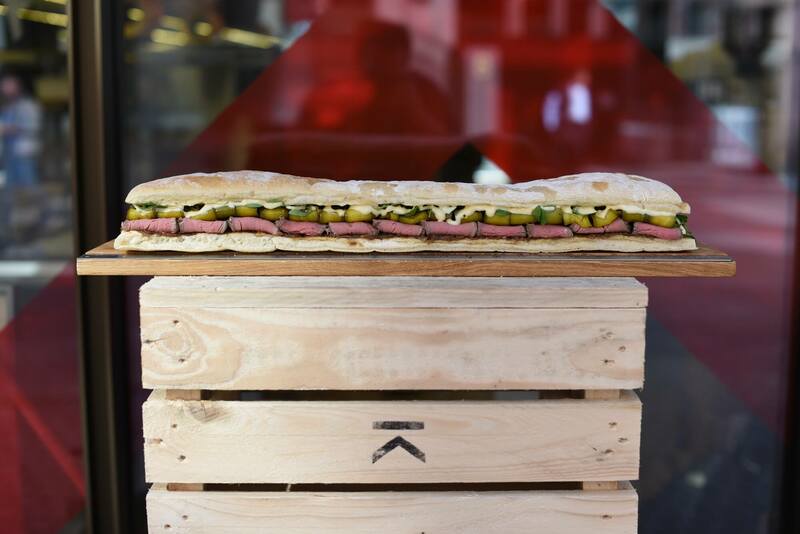 Freshly baked French baguettes filled with Vietnamese meats, pickles and a generous helping of fresh chillies. Choose between chicken, pork, beef or vegetarian topped with daikon and coriander. The Story: Spit and Roast know their birds, butter milk chicken to be precise. They’ve decked out a stainless steel catering van with spits and fryers and have become a popular fixture at KERB street markets. 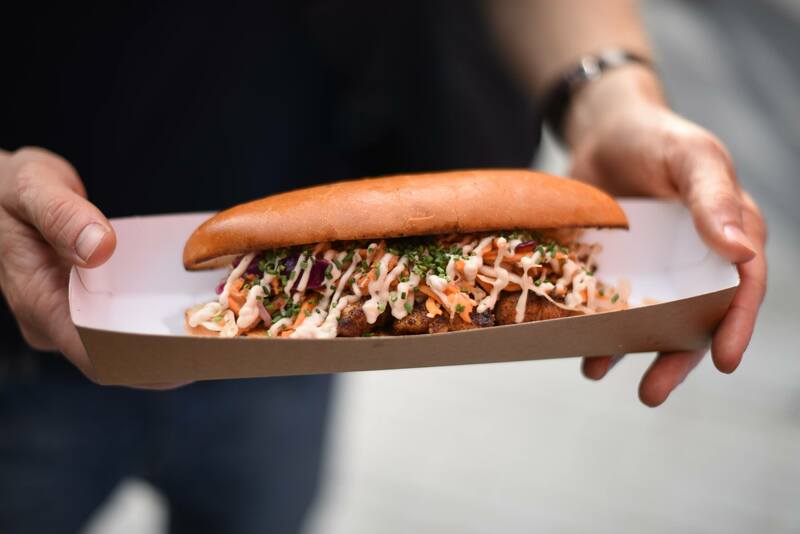 Their chicken bap is a well-loved sandwich with hungry Londoners, but don’t forget their pork belly slathered in their special Southern BBQ sauce. This really is a feast for the eyes and stomach. The Sandwich Lowdown: KFC have nothing on these guys. 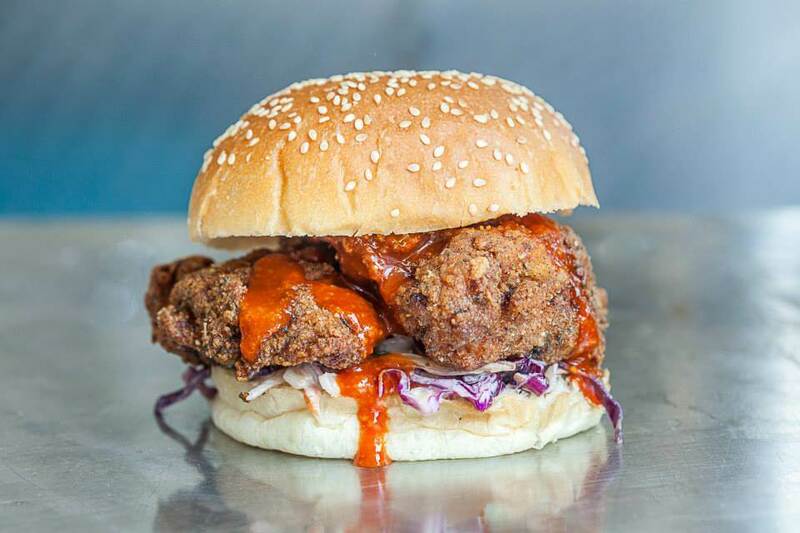 Put down that sad bargain bucket and tuck into their buttermilk chicken bap. Free range Suffolk chicken marinated in buttermilk and then deep fried in their secret Louisiana style coating. We don’t know what they put in it and to be honest, we don’t care – it tastes good and that’s all you need to know. To finish, they top the chicken with Mississippi style slaw and their own Korean hot sauce. Perfection. 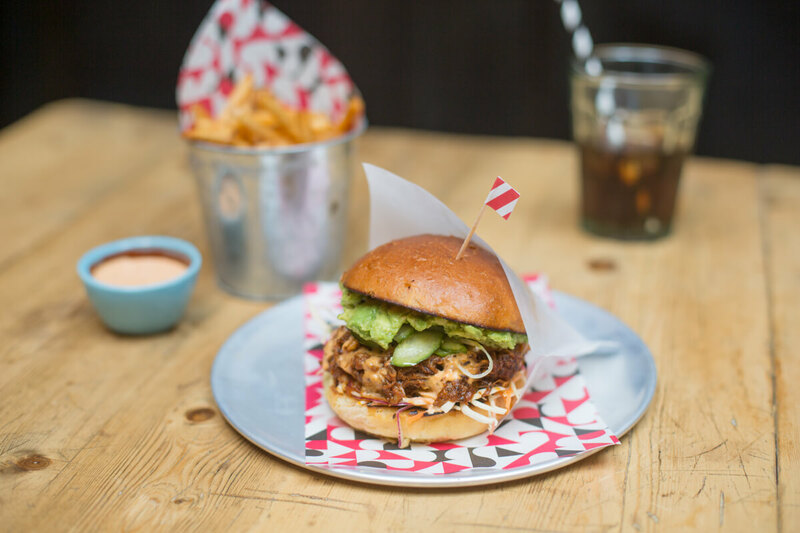 The Story: DF / Mexico, is a modern Mexican diner from the team behind Wahaca. They create Mexican dishes with an American influence – build your own fajiitas boards, burritos the size of our face and frozen margaritas. The Sandwich Lowdown: So you might want to stick to nachos, tacos or burritos, but trust us when we say throw the Mexican rulebook out of the window and order their chilli beef torta. This sandwich is full of meaty goodness. A buttery brioche bun filled with your choice of meet – grilled chicken, 4 hour slow cooked beef, pork pibil or crumbed cod. Pair it with some smashed avocado, slaw and pickles and you’ve got one killer dish. The Story: Husband and wife duo Nick and Nadia Stokes started Gourmet Goat in a bid to show people what can be done with kid goat meat. It has certainly worked, they’re now serving up some of the best goat dishes around – koftas, souvlaki salads and pies. There’s more to goats than just producing goats cheese, don’t you know. The Sandwich Lowdown: Their koftas are a combination of kid goat mince, potato, red onion, mint and seasoning. This certainly isn’t a dry kofta. To finish, homemade tzatziki made with seasonal herbs and a fresh chilli salsa are added for a subtle kick-all crammed into a fluffy Greek pita. The Story: The Deli in Clapham is from the people behind The Diary and is conveniently placed next door. It has been described as an ‘artisanal delicatessen’ – in our words, a really nice place to pick up well-made loaves and homemade chutneys and preserves. They have a rooftop garden with their own beehives and a smoke house creating everything on site for the shop. The Sandwich Lowdown: If you’re a sourdough fan, this is the sandwich for you. They bake all their own bread and they even make a gluten-free option too. Everything is baked, smoked, pickled or grown on site including their salt beef. The Story: The chaps are Sub Cult look like they should belong in a mod tribute band – not that that’s a bad thing. They’ve combined great American flavours with classic British fare with their gourmet sub rolls. Their Rodeo Sub is a combination of 28 day hung beef, provolone cheese, white truffle mayo and crispy shallots and it is an absolute sandwich game changer. The Sandwich Lowdown: Their sub rolls are piled high with loads of different fillings. No sad sandwiches here, just freshly made to order sarnies packed full of flavour and quality ingredients. The Sub-Marine roast is an absolute beast – a brioche sub with pork,scallops, calamari and crackling. A meaty, fishy delight. The Story: Steak, wine and classic cocktails is the order of the day at Smith & Wollensky. They’ve received big love Stateside for their steaks and they’ve brought their prized prime cuts to London. Only opened in June, Smith & Wollensky steaks are USDA Prime, dry-aged and butchered on-site. 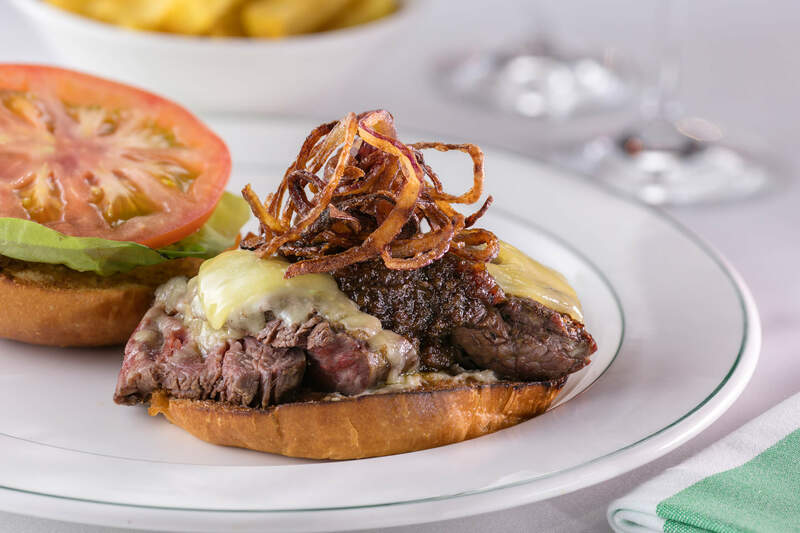 The Sandwich Lowdown: The signature Steak Sandwich is available on the lunch menu and is . This steak beauty comes served with bacon jam, horseradish aioli, white cheddar and ‘angry onions’. Using the finest 28 day-aged steaks, each one is hand-selected for rich and even marbling for maximum taste. The Story: Melt in the mouth, succulent and juicy ribs is what makes Miss P’s Barbecue a street stall favourite. Bringing the flavours of Atlanta to London, Miss P’s Barbecue focuses on smoking and marinating ribs using homemade rubs and fuelling their smokers with charcoal and oak for ‘that’ smokey flavour. This stall has passion, soul and a whole lot of love for the meat they serve. It’s proper meat, cooked proper well. 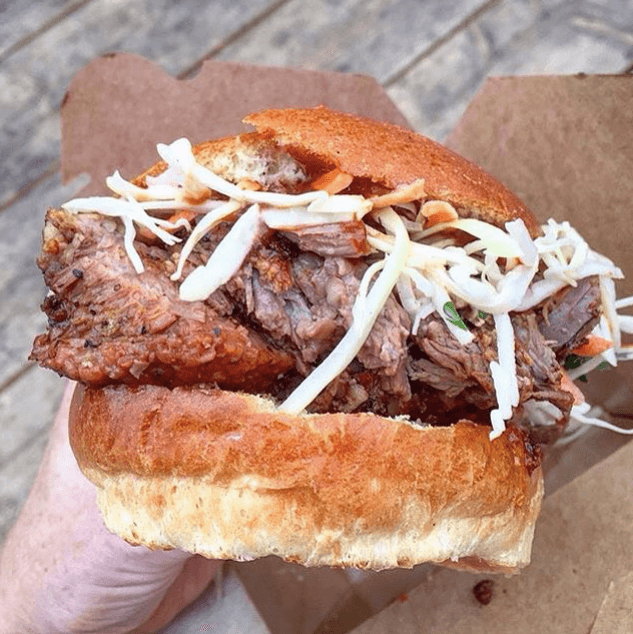 The Sandwich Lowdown: Their dry rubbed, slow cooked beef brisket is shredded and is thrown into a bap, covered in homemade coleslaw and BBQ sauce. The beef brisket is tender, flavoursome and downright delicious. It’s all about grabbing a fist full of napkins, finding a bench and getting stuck in. The Story: What happens when you mix the upbeat rhythm of South America with the elegant refinement of Japan, throw in the vibrancy of Miami and sprinkle with the eclecticism of Venice Beach? You get MOMMI, a Japanese-Latin Raw Bar and Grill with cuisine influenced by Japanese and Latin communities. The Sandwich Lowdown: This Peruvian inspired sandwich is packed full of punchy flavours and vibrant colours. From the heat of the anticuho salsa to the refreshing taste of the coriander crème fraiche, this sanguche is an Argentinian staple that must be tried. 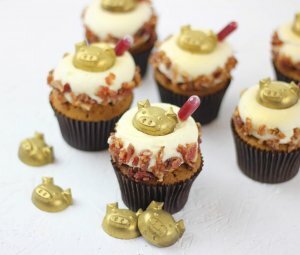 There’s more to MOMMI than just sushi.